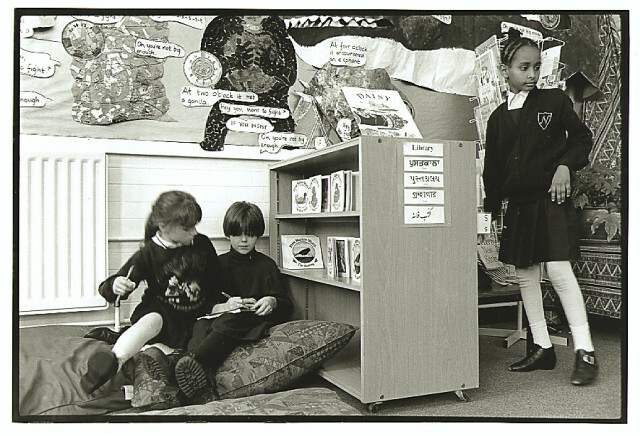 The featured archive photograph is from a photo story that I did in 1994 (amazing to think it was 19 years ago – yikes!) in a multi ethnic school in North London. At the time 21 different languages were being spoken in one class alone, and as can be seen from the the sign in the photo the main ones beings Indian and Pakistani languages. If today as a documentary photographer I were to do a similar project the picture would be different. In January of this year the growing diversity of London’s population was confirmed, figures revealed that more than 100 different languages are spoken in virtually every borough.The most common other language besides English is Polish, spoken as the main language by nearly two per cent of residents, followed by Bengali, Gujarati, French, Urdu and Arabic. The most diverse borough being Hillingdon, followed by Newham, both are places where you can do some really good street photography. The featured photo was shot using a Nikon FM2 and 35mm lens, using Fuji Neopan 400. And nearly 20 years later, I still like the image. Please contact me if you have any comments or would like to commission a professional photographer.